This portrait of the bride and groom kissing was taken at night time in front of Della Terra Mountain Chateau. 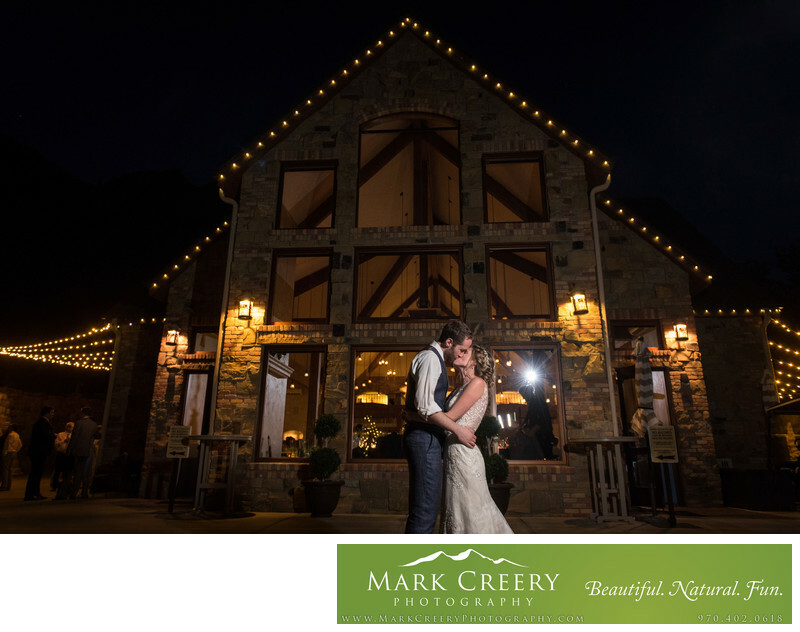 It captures the ambience of the wedding venue lights, both outside and inside. When making this image I had to consider how much light I wanted to introduce into an already beautifully-lit scene. To light the couple I had my assistant hold a video light slightly off-camera, which highlighted the couple enough to make them the star of the image. I also fired my off-camera flash that was inside the reception using a radio-controlled trigger. This added a flare that draws the eye inside after seeing the couple. I used a slow shutter speed to bring up the ambient light as well. The couple had a perfect day at Della Terra. The weather was ideal, and they even saw plenty of elk and got some photos with them in the background. We explored the grounds and they even climbed up some rocks to get some dramatic scenes that highlight the pretty features of the location. This is the premier wedding venue in the Estes Park area, so be sure to check it out if you're looking for your perfect wedding venue.